Here I am cupcake #2. My dilemma this week was to make a cupcake with ingredients I already had in the kitchen. And believe me, there wasn't a lot in the kitchen. Then I remembered the one cookie I seem to always have the makings for- the snickerdoodle. What's not to love about snickerdoodles? They're basically sugar cookies wrapped up in my favorite spice, cinnamon, with a bunch of extra sugar. Yum. Everyone will assume you're baking cookies, but these are better. The thing about this cupcake is that it was so good that it almost wasn't. With my crazy work schedule lately, I've been leaving my house before the sun comes up and returning after sunset. All work and no natural light is no bueno for someone wanting to take nice photos of cupcakes. I set aside a couple of them to take photos of when I would have better lighting but by the time I was able to take the photos, the cupcakes disappeared. Seems someone thought they would be better in their tummy than in my photos. Luckily, I had snapped a quick shot with my phone to post on instagram. That lovely background is the refrigerator. Classy, I know. Preheat oven to 350 degrees F. Line muffin pan with paper liners. In a small bowl, mix together the flour, baking powder, cinnamon and salt. In a larger bowl, cream together the butter and sugar. Blend in the eggs one at a time. Stir in the vanilla. Alternate between adding the dry ingredients and the milk to the batter, beginning and ending with the dry ingredients. Stir between each addition. Fill cupcake liners 2/3 full with batter & bake at 350 for 15-18 minutes or until the tops are golden brown. Allow them to cool in the pan for few minutes before removing them to finish cooling. Beat the butter and cream cheese in a bowl until smooth. Add in the powdered sugar one cup at a time until it's all incorporated. Stir in the vanilla & cinnamon. Add the milk one tablespoonful at a time while mixing until it reaches the desired consistency. Fill a pastry bag (or ziploc bag with a corner snipped off) with the frosting and pipe onto the cupcakes. 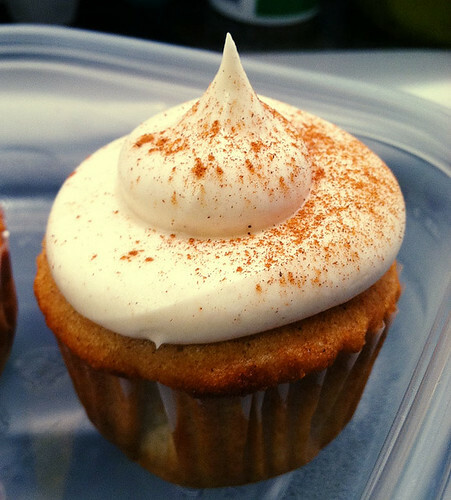 These cupcakes are best eaten within 2-3 days of baking. I just made these for a book club tonight and they were a huge hit. Thanks for sharing! I was laughing at your new years resolution post, because I just got into weight training and cupcakes... so I understand the conflict!